Old green goddess bronze fire bell. 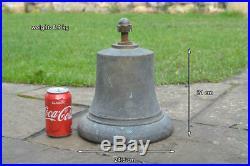 Welcome to my listing for this large brass bell is date stamped 11/52 (November 1952). 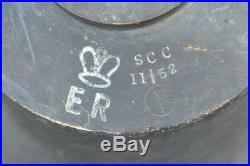 It has the initials ER (Elizabeth Regina) surmounted by a stylised crown. 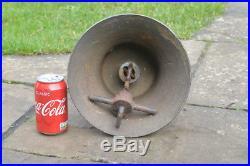 This was a general purpose bell made at the time of the'Cold War'. Over 5,000 Bedford'Green Goddess' fire pump engines were made. These pumps were to be used for Civil Defence following a nuclear attack! 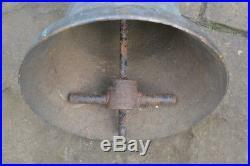 This type of bell was fitted within a gantry on the roof of the fire pump engines. The engines were disbanded in 1968 and many of the engines were scrapped. Some of the bells were'souvenired'. Some surviving engines were used in 1977 during the Fireman's Strike and again in 2002/3, But by this time the bells had been removed and replaced with twin air horns fitted to the bell gantry. 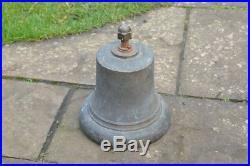 There are no cracks or serious damage to the bell although there is a small dent to the bottom edge where i guess it has been dropped or similar in the past. 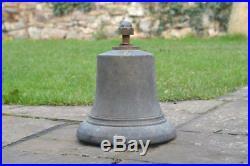 The bell is complete with its original clanger and rings fine. The original old green paint is also still very much evident although this will clean off easily and polish if thats the look you require. Great piece of usable British history and appreciating asset. Please scroll down for more pictures and dimensions. Any questions - please feel free to ask. There may be a small additional postal charge. If in doubt please ask. The item "Queen Elizabeth large brass Bell E.'Green Goddess' Fire FREE DELIVERY" is in sale since Thursday, December 28, 2017. 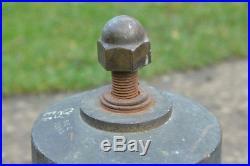 This item is in the category "Antiques\Architectural Antiques\Hardware/Home". 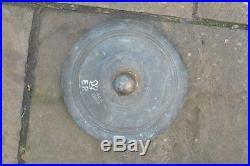 The seller is "raflees133" and is located in Exmouth, Devon. This item can be shipped to United Kingdom, Austria, Belgium, Bulgaria, Croatia, Cyprus, Czech republic, Denmark, Estonia, Finland, France, Germany, Greece, Hungary, Ireland, Italy, Latvia, Lithuania, Luxembourg, Malta, Netherlands, Poland, Portugal, Romania, Slovakia, Slovenia, Spain, Sweden, Australia, United States, Canada, Japan, New Zealand, Israel, Hong Kong, Norway, Indonesia, Malaysia, Mexico, Singapore, South Korea, Chile.